Emperor Daigo (醍醐天皇, Daigo-tennō, February 6, 885 – October 23, 930) was the 60th emperor of Japan, according to the traditional order of succession. Daigo's reign spanned the years from 897 through 930. He is named after his place of burial. 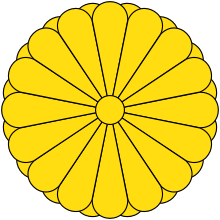 Before his ascension of the Chrysanthemum Throne, his personal name (imina) was Atsuhito (敦仁親王) or Ono-tei. Atsuhito-shinnō was the eldest son of his predecessor, Emperor Uda. His mother was Fujiwara no Taneko, daughter of the minister of the center, Fujiwara no Takafuji. He succeeded the throne after his father, the Emperor Uda, abdicated in 897. 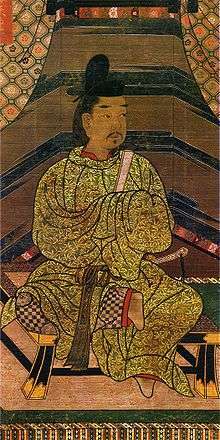 Daigo had 21 empresses, imperial consorts, and concubines; he had 36 imperial sons and daughters. The era name was changed in 898 to mark the beginning of Emperor Daigo's reign. The highlight of Daigo's 34-year reign was that he ruled by himself without the regency of the Fujiwara clan, though he himself was part Fujiwara. July 6, 897 (Kanpyō 9, 3rd day of the 7th month ): In the 10th year of Uda-tennō 's reign (宇多天皇十年), Emperor Uda abdicated; and his eldest son received the succession ("senso"). 897 (Kanpyō 9, 5th day of the 7th month): Emperor Daigo formally acceded to the throne (sokui). December 7, 899 (Shōtai 2, 1st day of the 11th month): The sun entered into the winter solstice, and all the great officials of the empire presented themselves in Daigo's court. February 2, 900 (Shōtai 3, 3rd day of the 1st month): Daigo went to visit his father in the place Uda had chosen to live after the abdication. 900 (Shōtai 3, 10th month): The former Emperor Uda traveled to Mount Kōya (高野山, , Kōya-san) in what is now Wakayama prefecture to the south of Osaka. He visited the temples on the slopes of the mountain. January 23, 901 (Engi 1, 1st day of the 1st month): There was an eclipse of the sun. 901 (Engi 1, 1st month): The Sugawara Michizane "incident" developed, but more details cannot be known because Daigo ordered that diaries and records from this period be burned. 906 (Engi 5, 4th month): Ki-no Tsurayuki presented the emperor with the compilation of the Kokin Wakashū, a collection of waka poetry. 909 (Engi 9, 4th month ): The sadaijin Fujiwara no Tokihira died at the age of 39. He was honored with the posthumous title of regent. 929 (Enchō 7, 8th month): Floods devastated the country and many perished. July 21, 930 (Enchō 8, 26th day of the 6th month): A huge black storm cloud traveled from the slopes of Mt. Atago to Heian-kyo accompanied by frightful thunder. Lightning struck the Imperial Palace. Both Senior Counselor Fuijwara-no Kiyotsura (also known as Miyoshi no Kiyoyuki) and Middle Controller of the Right Taira-no Mareyo and many other subaltern officers were killed and their bodies were consumed in the subsequent fires. The deaths were construed as an act of revenge by the unsettled spirit of the late Sugawara Michizane. October 16, 930 (Enchō 8, 22nd day of the 9th month): In the 34th year of Daigo-tennō 's reign (醍醐天皇34年), the emperor fell ill and, fearing that he might not survive, Daigo abdicated. At this point, the succession (senso) was said to have been received by a his son. Shortly thereafter, Emperor Suzaku is said to have acceded to the throne (sokui). October 23, 930 (Enchō 8, 29th day of the 9th month): Emperor Daigo entered the Buddhist priesthood in the very early morning hours. As a monk, he took the Buddhist name Hō-kongō and, shortly thereafter, he died at the age of 46. This monk was buried in the precincts of Daigo-ji, which is why the former-emperor's posthumous name became Daigo-tennō. Daigo also ordered construction of several halls in the Daigo-ji, such as the Yakushi hall. The actual site of Daigo's grave is known. This emperor is traditionally venerated at a memorial Shinto shrine (misasagi) at Kyoto. The Imperial Household Agency designates this location as Daigo's mausoleum. It is formally named Nochi no Yamashina no misasagi in Fushimi-ku, Kyoto. Sesshō, Fujiwara no Tokihira (藤原時平), 909. Sadaijin, Fujiwara no Tokihira 871–909. Sadaijin, Fujiwara no Tadahira (藤原忠平), 880–949. Udaijin, Sugawara no Michizane (菅原道真), 845–901. Udaijin, Minamoto no Hikaru (源光), 845–913. Udaijin, Fujiwara no Sadakata (藤原定方), 873–932. Naidaijin, Fujiwara no Takafuji (藤原高藤), 838–900. The years of Diago's reign are more specifically identified by more than one era name or nengō. Imperial Princess Seishi/Tadako (斉子内親王) (921–936), 27th Saiō in Ise Shrine 936, but she didn't go to Ise because of her death. Imperial Prince Kaneakira (兼明親王) (914–987) (11th son), also called saki no chūshoō (前中書王). Chūshoō means Nakatsukasa-kyō (中務卿). Imperial Princess Hideko (英子内親王) (921–946), 29th Saiō in Ise Shrine 946, but she didn't go to Ise because of her death. Imperial Prince Moriakira (盛明親王) (928–986), given the family name 'Minamoto' from Emperor (Shisei Kōka, 賜姓降下); later, Imperial Prince in 967. ↑ Ponsonby-Fane, Richard. (1959). The Imperial House of Japan, pp. 68–69. ↑ Titsingh, Isaac. (1834). Annales des empereurs du japon, pp. 129–134; Brown, Delmer et al. (1979). Gokanshō, pp. 291–293; Varley, H. Paul. (1980). Jinnō Shōtōki, pp. 179–181. ↑ Varley, p. 179; Brown, p. 264; prior to Emperor Jomei, the personal names of the emperors were very long and people did not generally use them; however, the number of characters in each name diminished after Jomei's reign. 1 2 Varley, p. 179. 1 2 Brown, p. 293. ↑ Tisingh, p. 129; Varley, p. 44; a distinct act of senso is unrecognized before Emperor Tenji; and all sovereigns except Jitō, Yōzei, Go-Toba, and Fushimi have senso and sokui in the same year until the reign of Emperor Go-Murakami. 1 2 Titsingh, p. 131. 1 2 3 Titsingh, p. 132. 1 2 Titsingh, p. 134. ↑ Brown, p. 293; Varley, p. 44. ↑ Titsingh, p. 134; Brown, p. 292; Varley, p. 181. ↑ Furugosho: Kugyō of Daigo-tennō. 1 2 3 4 5 6 7 Brown, p. 291.